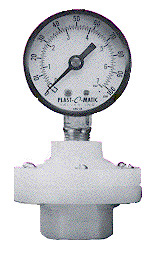 Home>Plumbing>Plastomatic Valves>Plast-O-Matic Ultra-Pure PTFE Diaphragm Gauge Guards > Plastomatic Ultra-Pure PTFE Diaphragm Gauge Guard - 1/4" x 1/2"
 Unique energized PTFE diaphragm safeguards media purity.  Wide range of service: 0-30 PSI to 0-200 PSI.  Kynar(PVDF) housing idiel for ultrapure liquids.  Available with or without gauge. Gauge indicates PSI and bar.  Clear acrylic cover-shield available.  1/2 NPT connection; 1/4 or 1/2 instrument connection.